Tuesday's early-morning storms left behind damage across North Texas. 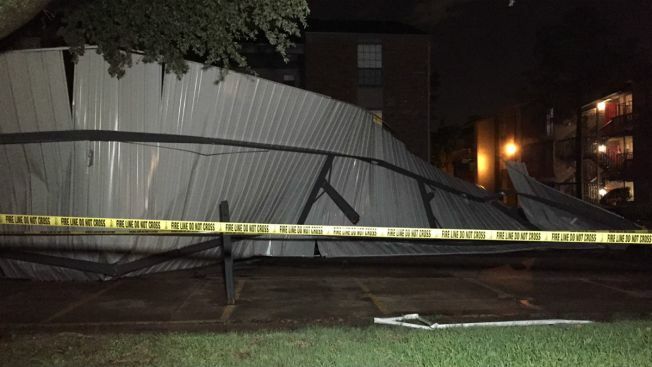 In Irving, a carport at the Promenade at Valley Ridge apartments was ripped from its supports. The National Weather Service received a report that the wind damaged the carport around 12:50 a.m. as thunderstorms rolled through the area. The metal roofing of the carport was pushed up against an apartment building as well. No injuries have been reported with the damage. It's unclear how many vehicles may have been under the carport and how man of them suffered damage. The apartment complex is located just east of D/FW International Airport on Valley View Lane.